Roasting butternut squash intensifies its flavor and reduces the prep work for this delicious, versatile lasagna. (Use the time you save to wash and inspect the leeks, which may harbor bugs and tend to be quite dirty!) The extra work spent cleaning the leeks is worth the effort -- they impart a wonderful savory flavor to the Béchamel sauce and make a great counterpoint to the sweetness of the squash. P.S. Don't be daunted by the lengthy leek-preparation instructions -- the process is much simpler to do than it is to describe! ​Preheat the oven to 425° F. Brush the butternut squash halves with olive oil, and place face down on a lightly oiled baking pan. Roast the squash for 45 minutes to an hour, or until the squash is tender and the skin is beginning to blister and turn brown in spots. Remove the squash from the oven and set aside until it is cool enough to handle. Reduce the oven heat to 350° F.
While the squash is roasting, clean the leeks -- slice off the root ends, and peel away any outer layers that are especially tough or are trapping large amounts of dirt. Give the leeks and your knife a rinse, and chop off the dark green tops (the tough upper portion of the leeks that fan out). Transfer the sliced leeks to a large bowl filled with cold water, and swish the leeks around with clean hands to loosen any remaining soil. Scoop the leeks into another bowl, and discard the dirty water. Return the leeks to the first bowl, add fresh water, and repeat the process until the leeks are clean and the water remains clear. Drain the leeks and set aside. Tip: You can simplify the cleaning process (and avoid fishing for leeks!) by nesting a large mesh strainer in the rinsing bowl. Just lift the leek-filled strainer out of the dirty water, and return it to the bowl of clean water for each subsequent rinse. Once the squash has cooled enough to touch, turn the halves over and scoop the flesh into a large bowl. Discard the skin. Mash the squash with a large fork until it is fairly smooth. Set aside. Melt the butter (or warm the olive oil) in a large, heavy-bottomed saucepan or Dutch oven set over medium heat. Add the leeks and cook, stirring frequently, until they soften and the white parts begin to turn translucent, about 5 to 7 minutes. Sprinkle the leeks with the flour and continue to cook for 2 minutes more, stirring constantly. Slowly pour in the milk, whisking constantly, and cook until bubbles begin to break the surface. Reduce the heat and simmer for 5 to 7 minutes more, or until the sauce is thick enough to coat the back of a spoon. Whisk in the thyme, salt, nutmeg, and pepper. Remove from the heat and set aside. Lightly oil a 9x13-inch baking dish. Ladle about 1 cup of sauce into the baking dish and spread to coat the bottom. Cover the sauce with 3 lasagna noodles, leaving a bit of space between each (the pasta sheets will expand as they cook). Cover the noodles with half of the mashed butternut squash, spreading it into an even layer with a spatula or clean hands (work gently so you don't break the noodles). Sprinkle with a third of the grated cheese (if using). Top with 3 more noodles. Ladle one cup of the sauce over the noodles and spread evenly to coat. 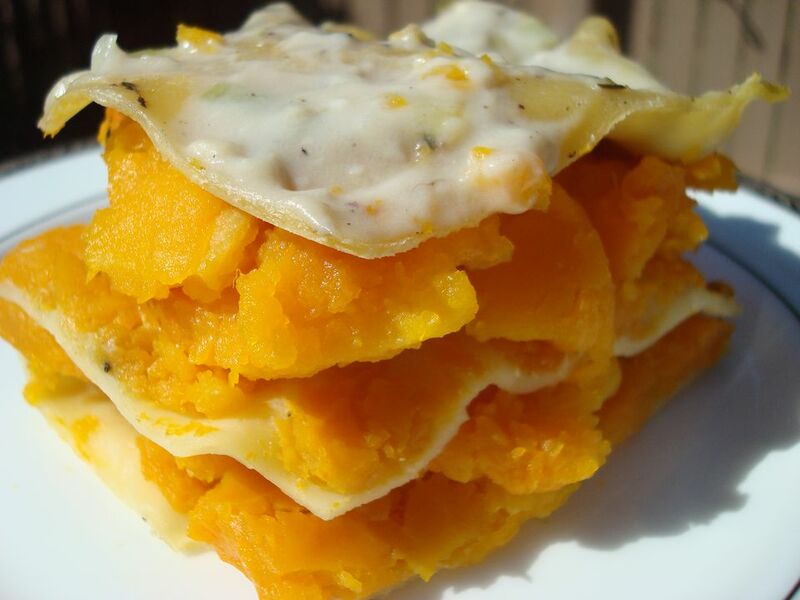 Make another layer with the rest of the squash, half of the remaining cheese, and another cup of sauce. Cover with the last 3 noodles, and enough sauce to completely cover them. Sprinkle evenly with the remaining cheese. Cover the baking dish with foil, tenting if necessary so that it doesn't touch the top layer of noodles. Bake in the 350° F oven for 35 to 40 minutes, or until the sauce is bubbling and the noodles are tender. Remove the foil and bake for about 10 minutes more, or until the cheese is golden. Remove from the oven and allow the lasagna to rest for 10 minutes before serving. Enjoy! Pareve (Dairy Free) Variation: To make a pareve, vegan lasagna, substitute olive oil or non-hydrogenated pareve margarine for the butter, use pareve soymilk instead of milk, and omit the cheese.